If you've never met a content strategist before, and you know very little about content strategy, how would you begin to hire some one to fill that roll? This is an interesting question that a new post over on CMS Wire attempts to answer. That's a pretty good list. In addition to cross communication skills I'd also add, an interest in basic Web technology. I'm not saying that you have to be a programmer, but if you don't have some idea of how all the parts work together, then spotting the specific content issues may be a problem. Johnny Holland Magazine is an open collective talking, sharing and finding answers about the interaction between people and products, systems or processes. 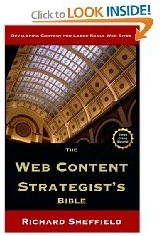 This week they are all about content strategy and how content strategy solves problems. I'm looking forward to a lot of great conversation on top of the top-flight articles. Should be an interesting week!